In 1968, Colonel Biggs, retired (Engineers), a few employees at the Ministry of Supply, Proof and Development establishment at Pendine including civilian and other military personnel decided to construct a bowling green. At this time it would be for the benefit of civil servants, residing in the vicinity. This done, the task had been completed although it wasn't until May 1971 that the green was officially opened. There was a small building adjacent to the green, which had been used by the Ministry of Supply for carpentry evening classes. This became the Pendine Bowls pavilion. The clubs first president was Lieutenant Colonel Edge M.C. Although Pendine was just across the Pembrokeshire border, the club was accepted into their league in 1974. One of the first teams to play at Pendine and included one lady by special permission as men were in short supply. Towards the late seventies, persons outside the Ministry showed interest, and the membership was extended to include them. Gradually the number of members had doubled and included several ladies, who apart from forming the basis for a Ladies League busied themselves preparing teas for visitors. 1984 saw the introduction of blazer badges and lapel badges. The design was unique depicting the insignia of the P & EE representing the three services. Also in 1984, the club held their first club competitions for which eleven trophies were presented by members and businesses. The various competitions were played over several weeks with Finals' Day being a social occasion. In order to receive grants from the County Council and Sports Council, the name had to be changed to Pendine and District Bowls Club. This done, grants were received. Members began the task of extending the pavilion, to create a clubhouse with facilities such as toilets, changing rooms, kitchen and a bar. Mr Richard Roberts, a builder, undertook the major work, assisted by a number of members. 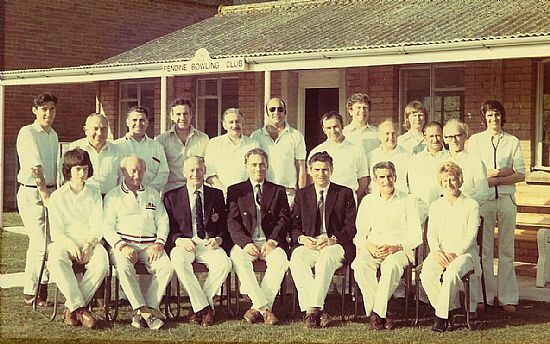 The work was completed in time for the 1996 season when Mr Jim Lloyd represented Pendine as County President.